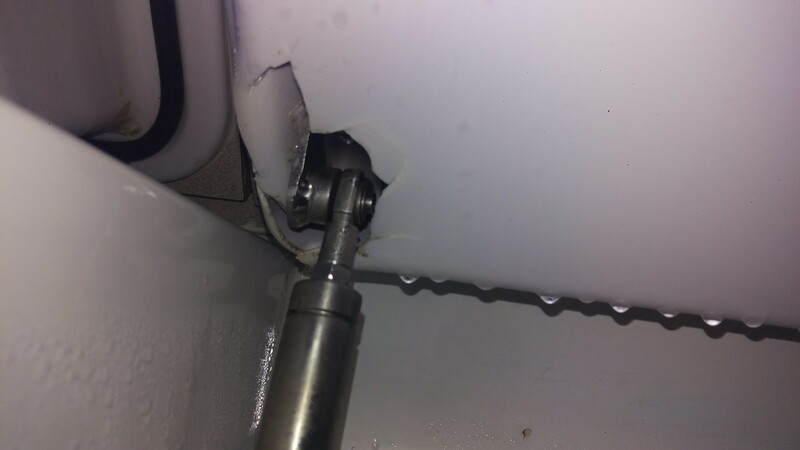 Hi - Looking for suggestions on how to fix a hole in the refrigerator top where the lid strut has been pushed through into it. I might trim a piece of white plastic to fit the hole and glue it in place with a two part epoxy with everything good & dry at room temperature. As long as aesthetics isn’t too much of an issue. Will still be good functionally. I like the epoxy with the side by side 10 ml syringes. Inexpensive & easy to use. Stuff works great. The liner appears to be made of very thin fiberglass. If so, repair with fiberglass. Looks like there is no insulation inside. I would reinforce the area where the strut attaches, to spread the load. Since you already have a hole in it I would opt to re-insulate that hatch . Looks like there is nothing inside it . Your gonna have to remove it to repair it anyway. Is expanding foam an option for insulating the hatch? ...Is expanding foam an option for insulating the hatch? Not without drilling LOTS of holes.